Tempest Recordings & Slice Events have teamed up once more to present a very special event at our newest, most favourite Melbourne venue, The Purple Emerald. "Georythm" will feature Tempest artists Guilty Hero, Garagee, Stickleback & Arcane Trickster, along with our good mates, The Med School. 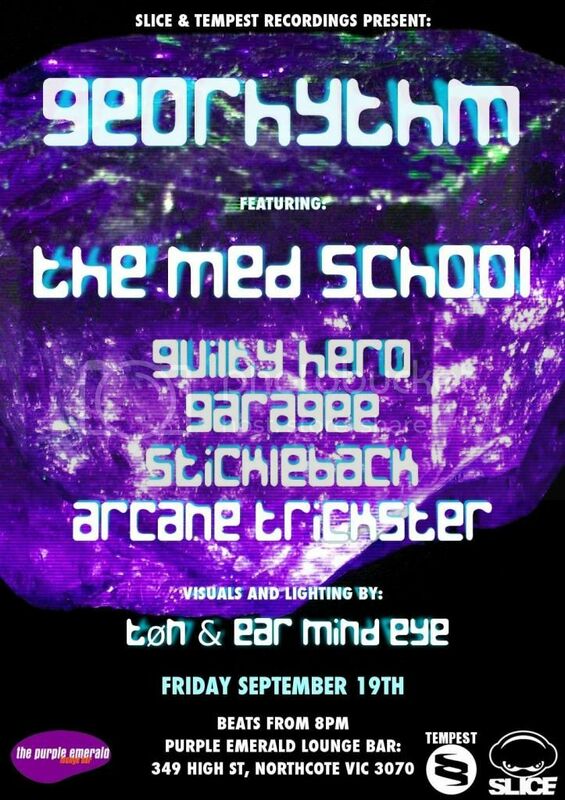 Visuals will be provided by Slice's Tøn & Ear Mind Eye (the new alias for Fate Aeffect). Friday 19th September at The Purple Emerald, 349 High St Northcote. While we are on the topic of gigs, Tempest Recordings is set to be well represented at Earthcore, with Hesius Dome, Robodop Snei, Numatica & Arcane Trickster all appearing, alongside such luminaries as Tripswitch, Hallucinogen, Shpongle, Gus Till, John 00 Fleming and heaps more!